Asustek Computer's new tablet series, the ZenPad, will run Android 5.0 on Intel's latest Atom processors. The ZenPad series include tablets in the 7, 8 and 10-inch display sizes, and will start arriving in the third quarter, the PC maker said on the eve of the Computex trade show in Taipei. 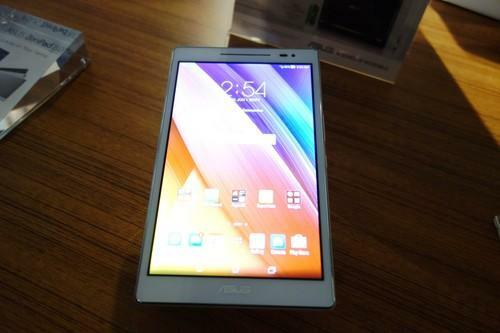 "Today, we are going to redefine what a tablet can be," Asus chairman Jonney Shih said at a company event there. Despite Shih's grand claim, the tablets seem fairly conventional. Although Asus claimed the products have a "luxury" feel, the backing on the low-end devices is a textured plastic. Asus touted the tablets as fast devices thanks to the Intel Atom processors inside. The tablets will come in a variety of configurations, but most will use Intel's "Cherry Trail" x3 four-core, 64-bit chips. One of the higher-spec tablets, the ZenPad 8.0 S, uses an Intel Atom Z3580 chip, has 4GB of RAM, and a 1536-by-2048-pixel display. It also has a USB 3.0 Type-C port, an 8-megapixel rear camera, and a 5-megapixel front-facing camera. It weighs 298 grams and Asus claims it has an 8 hour battery life. Unlike the lower-spec tablets in the series, the ZenPad 8.0 S has a metal and leather back. Asus also plans to offer protective covers for the tablet in a variety of colors, including some covers with built-in batteries that add 15 hours of battery life.